What do Fidel Castro and Chairman Mao have in common? No, not that—the other thing. 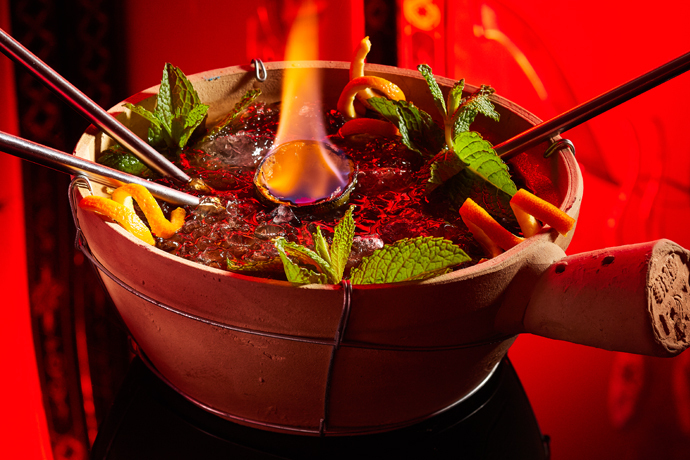 You’ll see at Calle Dão, a sultry new Midtown tropic of Cuban-Chinese food, now open near Bryant Park. You can’t go to Cuba (unless you’re part of a “Save the Rum” humanitarian effort). So maybe you don’t even know there’s a century-and-a-half-old precedent of delicious, pork-fueled Cuban-Chinese culture. Well, this place is a little slice of it. What you’re looking at here: basically, the set from a deleted scene between Michael Corleone and Hyman Roth. Possibly one where they’re discussing goat burgers with hoisin salsa or seafood paella with Chinese sausage... or who needs to go. What you’ll do here: wear something linen maybe, and post up with a date between a potted palm and a glass case of Cuban cigar boxes (empty, dammit). But before that, you’ll want to take a look at the slideshow, which is packing rum cocktails and an enormous whole fish. ... Not the kind anyone sleeps with.